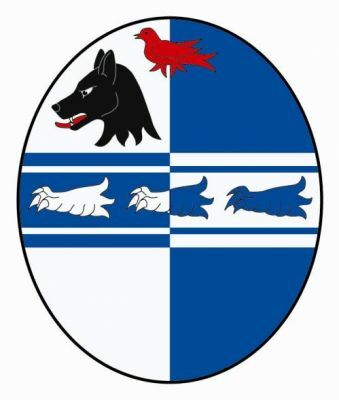 Arms: Per pale Argent and Azure on a fess cottised three lions’ gambs erased fesswise all counterchanged; in dexter chief quarter a wolf’s head erased Sable. Miss Dorothy Vivien Wilson, a living armiger, was born in 1928, younger daughter of Sir Frank O’Brien Wilson, Kt. Bach., a substantial rancher in Kenya and member of the Kenya Land Commission, who was the fourth son of John Gerald Wilson, CB, of Cliffe Hall, Piercebridge, Darlington, England. Miss Wilson was a sometime member of the Lyon Office Staff at the time when David Reid of Robertland, Carrick Pursuivant, volunteered to prepare the “Ordinary of Arms”, Volume II, 1902-1973 in March of 1972. His request was approved by Sir James Monteith Grant, KCVO, the Lord Lyon, who allowed Miss Wilson to assist Reid in this work. Unfortunately Reid died suddenly on 20 December 1973 ( see WA entry on Reid ) with the work in its early stages. Miss Wilson bravely carried on alone the huge task of compiling the thousands of entries and for spending countless hours and several years to its final completion in April 1976. Miss Wilson has made a lasting contribution to the Heraldry of Scotland and is still alive and well & very active, we are told, as we write.